Not all of us who love fine wine are so fortunate to have come to it early in our lives. We don’t have the advantage of having it presented as part of our everyday cultural experience. We don’t get to grow up amongst the vines, with the vineyard as our playground. But many of us, who come to love wine, have had that seminal moment when wine begins to reveal itself to us in a oenological strip-tease of sorts. Starting with sweeter wines, usually. My first memory of wine, for example, came as a child at Christmas time when my grandmother, who was never really a drinker, would down a small tumbler of Manischewitz concord grape wine while preparing Christmas dinner. Don’t ask what a nice devout Roman Catholic lady was doing drinking a Kosher wine at Christmas– I have no idea how that started. What I can tell you is that somehow, that bottle of very sweet juice, appeared at the Holiday table every year (complements of one of my Schaeffer-swilling uncles, no doubt) with greater regularity than Santa Claus himself. And while we were not encouraged to drink it, somehow, my cousins and I always found a way to garner a few sips of that childhood nectar for ourselves. That, it turns out, was a gentler introduction to wine than Ntsiki Biyela had. This lady with the lovely smile is Ntsiki Biyela, a South African winemaker who found herself making wine by happenstance. Borne and raised in Zululand in the village of Kwa Nondlovu, Ntsiki (pronounced n-SEE-kee), short for Nontsikelelo, had no wine pedigree whatsoever. Yet despite these odds, in 2004 she has found herself as the winemaker for Stellekaya after studying oenology at Stellenbosch University. She has been named the Landbouweekblad Woman Winemaker of the year. Her story is an unusual one: She grew up as other young village girls did, performing daily chores like fetching and gathering firewood from a distant forest. She also studied in a poorly equipped rural school. After doing well in secondary school she was given an opportunity to study winemaking on a scholarship. Seizing the chance to do something that wasn’t even part of her culture must have taken a tremendous leap of faith, not to mention bravery. It must also have been startling for her given that she was disgusted by her first taste of wine– a dry one at that. (I can only imagine that she may have been expecting a taste of that sweet nectar from my childhood.) But as she became more familiar with it, it is clear that she had found her calling. 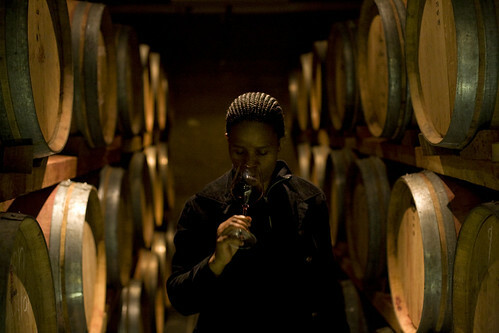 After graduating from Stellenbosch, she was recruited to be the winemaker at Stellekaya, an established winery. Rather than staying with the more traditional South African approach to red wines with pronounced wood flavors, she tries to produce wine that showcase the fruit in the most elegant way possible. I have been in touch with her recently and have learned that she is traveling in Italy where she is learing the Italian approach to Sangiovese based blends at the Tuscan winery, Petra. She tells me that she has fallen in love with this most Italian of varietals and that she has been able to identify some similarities between the Italian versions and her South African version. It will be interesting to see how the differences that she is able to experience will translate into her winemaking on her return home. That kind of learning can only result in production of even better wines in her hands. The Stellekaya winery, by the way, produces its own Sangiovese-Merlot-Cabernet Sauvignon blend called Hercules. The vocabulary of the wine world sometimes amuses her. At one tasting, she listened to the connoisseurs as they detected the intricate flavors. We are blessed to have such gifted and motivated people in the cellars.